The kids and I cannot wait to share with everyone our review of the movie, but until then we are excited to be able to offer one of our readers a set of two adult Wreck-it-Ralph t-shirts. We are giving away (1) Wreck-it-Ralph adult t-shirt (as shown above) in the winners choice of size: small, medium, large or extra large. Plus!! The winner will also receive a pink Vanellope von Schweetz adult t-shirt (shown below) in their choice of size: small, medium, large or extra large. 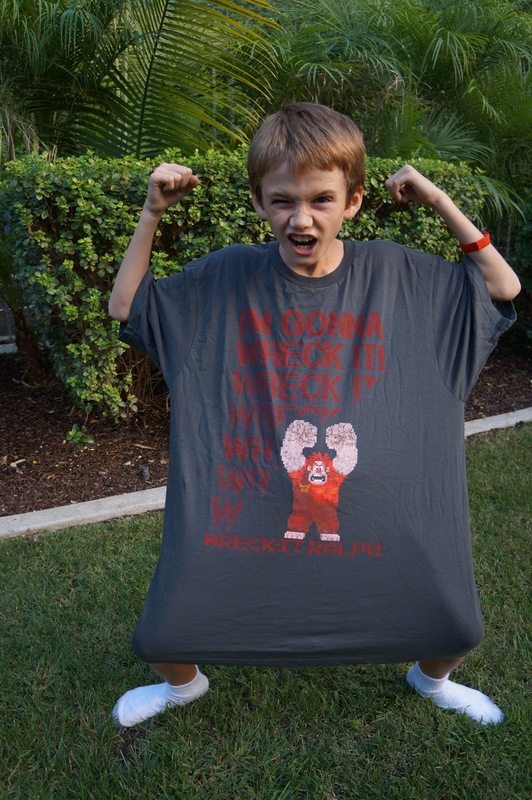 Disclosure: We were provided with complimentary t-shirts during a wreck-it-ralph press events. All our thoughts and opinions are of our own. I have to say with the amount of Mario I have been exposed to over the past few years with my son that he has to be my favorite! SO cool. I am dying to see this movie. My family is a bunch of video game junkies. That movie looks so fun! I can't wait to see it. I love Toad from the Mario Bros games! Q-bert!!! I loved the movie and my kids would flip for the shirts. I love Sheik from The Legend of Zelda: Ocarina of Time because the character is actually the titular princess of the game, but she escapes by using her wit being combat savvy. Sheik is a great character for my nieces to grow up with, and I made sure that they did. I <3 Mario Bros games and all the classics.